Jim Blackburn virtually invented the aluminum rod rack in 1977. It's what put Blackburn Design on the map, and in the race to carry things on bicycles, they've never looked back. Blackburn uses aircraft grade aluminum, exclusively, along with the finest mounting hardware and thoughtful attention to detail like strategically placed tie-down points and integrated splashguards to help ensure your stuff arrives in good shape. Just like you. 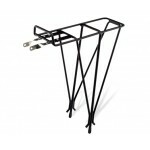 Blackburn EX-1 Expedition Rack: The Blackburn EX-1 Expedition Rack is the perfect bicycle rack. &..